Desert-adapted elephants drink at a waterhole in the ≠Khoadi-//Hôas Conservancy. Elzanne Erasmus recently sat down with Asser Ndjitezeua, the Chairman of the ≠Khoadi-//Hôas Conservancy in Namibia’s Kunene Region, to talk about the conservancy model, the benefits of tourism for communities and the big dreams that have come true for locals in the region, an area often referred to as Damaraland. On top of the Grootberg, Afrikaans for ‘big mountain’, a lodge is balanced along the edge of the mountainside. An even bigger view stretches out before it. The valleys, hills and rocky landscape are visually dramatic, but the vantage point is what makes it truly arresting. It’s here, on top of the world, that I sit down with the chairman of the local conservancy. Asser Ndjitezeua is the longest serving member of the ≠Khoadi-//Hôas Conservancy council. He knows the land and the people, and he is an avid advocate for the massive contribution which tourism makes to the bottom line of the people who call the district home. “The importance of tourism for the community cannot be understated,” Asser says. He explains how locals have come to realise that the natural resources and highlights of the region are the only drawcard for visitors and that these visitors are vital in putting bread on their tables. Thus the community has started to value resources such as wildlife and now takes an active participatory interest in their protection. According to Asser, tourism is the financial and socio-economic backbone of the conservancy. It is the major direct revenue generator for the conservancy and thus indirectly for the broader community, even those who are not employed by a tourism entity, as the community derives benefits from the conservancy construct. 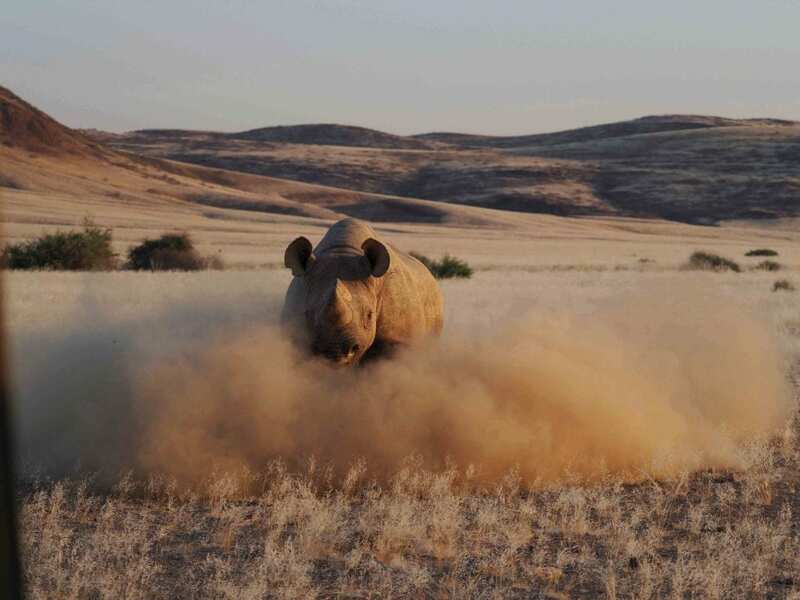 At Grootberg Lodge local rhino rangers employed by the conservancy offer rhino tracking excursions as an activity to guests. People now attach not only sentimental value to rhinos, but also a monetary one, as they can see how the presence and continued existence of these animals bring revenue to the lodge. Asser states that the tourism industry has also been an eye-opener for community members in many respects. By working in tourism they have the opportunity to develop skills they would never have been able to acquire otherwise and to better themselves beyond their humble beginnings. Another major benefit of revenue derived from tourism is the capacity it creates for conservation initiatives. 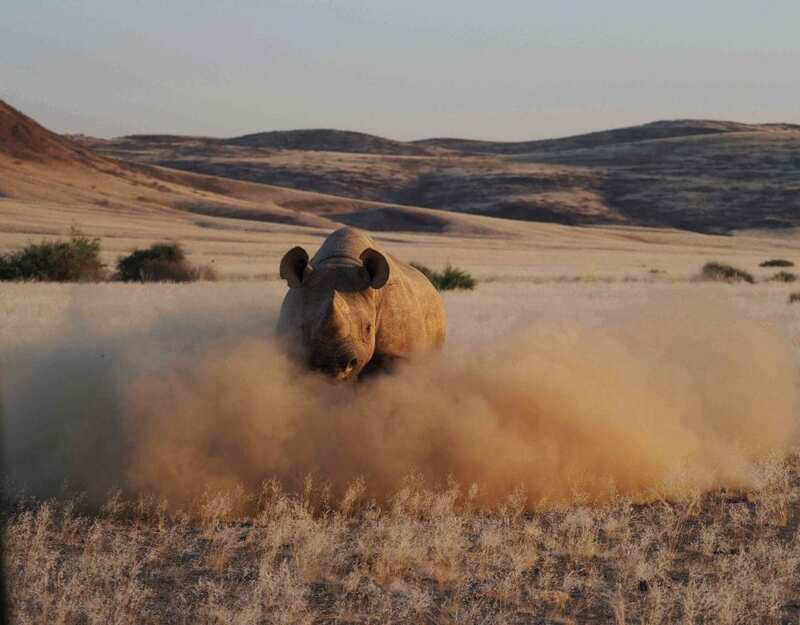 With income generated by activities such as rhino tracking, the conservancy is able to appoint more game guards, simultaneously creating more jobs and protecting wildlife. The community receives a diverse range of benefits from the conservancy model. Initiatives such as human-wildlife conflict mitigation tactics and infrastructural contributions in the form of boreholes and the like are one of the results. Women and youth empowerment projects are often funded by the conservancy council and scholarships are awarded to those looking to further their studies, especially in tourism. Grootberg Lodge is the only lodge in Namibia that is owned 100% by the local community. With the help of donor funding and loans, the community has set up a completely unique ownership model within the Namibian tourism industry framework. Unlike other joint-venture tourism projects where investors build lodges and pay a levy to the community, all the infrastructure and fixed assets of Grootberg Lodge are owned by the community. Journeys Namibia participates in the capacity of lodge management and marketing for which a management fee is paid. From humble beginnings to a local tourism powerhouse, the ≠Khoadi-//Hôas Conservancy and its members have made big dreams come true on the top of this majestic mountain. May tourism flourish and continue to support Namibians across the nation! For the past 13 years, Erenst has called Grootberg his home-not-so-far-away-from-home. He started as a builder, helping with the construction of the lodge, then moved on to work in maintenance, as a security guard, a driver, in the laundry room and the scullery. Eventually, he became a tracker and then a guide. This jack-of-all-trades is an invaluable member of the staff at Grootberg. Erenst recounts how he has loved his years here, finding it especially rewarding to be able to see the direct result of the work he does, be it for conservation or to the enjoyment of his guests. He says he has learned a lot by becoming a guide. “When you know the animals you can apply that knowledge to your own community, especially when it comes to conflict with wildlife, like on my own farm.” He says that he can now teach his neighbours about elephant behaviour and help both them and the animals by understanding how to act and react around them. When asked what type of work he would do if he weren’t in tourism he answered: “I’d probably be fixing donkey-carts next to the road. Starting as a waitress at Grootberg, with a school education that ended at Grade 9, Mariana’s story of success is a special one. In the beginning, she could speak neither Afrikaans nor English. Today she is the assistant manager of the lodge, speaks both languages fluently, is computer-literate and sends emails with professional efficiency. She says the most profound effect that the lodge and working in the tourism industry has had on her life is the fact that she was able to raise herself to where she is today, without taking hand-outs or struggling in an industry that would have taken her away from home. Learn more about the Namibia Community-Based Natural Resource Management model at www.nacso.org.na. Learn more about the ≠Khoadi-//Hôas Conservancy here. To book your stay at Grootberg Lodge visit www.grootberg.com. This article was first published in the Spring 2018 edition of TNN.